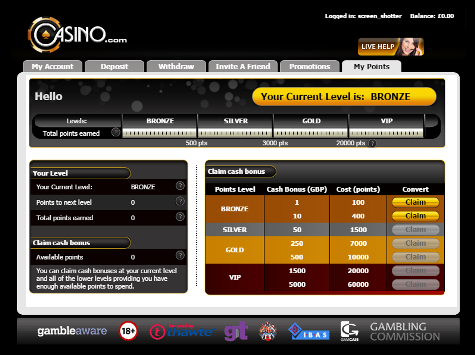 For example: For every £20 you wager on slots you will earn 1 loyalty point. Wager £200 and you will get 10 points. You are on silver level and you have 1,000 points. This means that you have enough points to claim only the $/£/€10 bonus twice, leaving 200 points in your balance. However, if you save your 1,000 points and earn an extra 500, you can claim a £50 bonus and have a much better redemption rate by getting an extra 33%. But it pays to save. If you keep playing and save your points up to 7,000, you will become a Gold member (at 3,000 points) and be able to claim the £250 cash bonus with an even better redemption rate. This will give you an extra 43% for your points! A maximum of £5,000 (Bronze, Silver and Gold), £20,000 (VIP) and £30,000 (VIP Elite) in cash bonuses from loyalty points can be redeemed per calendar month.